The Marshall-Donnelly-Combs Funeral Home in Nashville said Lindsey had died on Sunday following a brief illness. 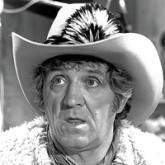 Lindsey played Goober on the Andy Griffith Show from 1964 to 1968. He went on to play the same character in Hee Haw from 1971 until it ended in 1993. His other TV credits included Mash and The Alfred Hitchcock Hour. "America has grown up with me," Lindsey said in an interview with the Associated Press in 1985. "Goober is every man, everyone finds something to like about ol' Goober," he added. In a statement released by the funeral home, Griffith said: "George Lindsey was my friend. I had great respect for his talent and his human spirit." Lindsey also appeared in several movies, including Cannonball Run II. And he lent his voice to animation films such as Robin Hood, The Rescuers and The Aristocats. Lindsey began his professional acting career on Broadway in the musicals Wonderful Town and All American.